Stop the insanity. Go digital. Then breathe. The Plus Portal changes the way you manage your fleet. 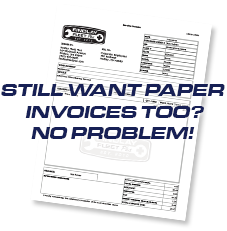 Online invoices. Instantly when service is complete. Payment history. Just select which dates and vehicles. Maintenance records. Service history at your fingertips. Appointment scheduling. No hassle. Quick and easy. Cost trending. Target the issues that are costing you money. Honestly! Take it from me, friend. There are no strings attached. These fine folks give you FREE access to their very own fleet management software, just to say "thanks for doing business with us." They are gentlemen and scholars. And mechanics. Very good mechanics. Click here to log in to the PLUS PORTAL.